Happy Chinese New Year everyone and welcome in the year of the (sea) Dragon! The Lembeh Seadragon (Lembeh Pygmy Pipedragon, Kyonemichthys rumengani) is a recently dicovered species that has been seen for the first time in Lembeh Strait in 2006. It belongs to the Family of seahorses and pipefishes and is closer related to them than to the actual seadragons that are known from Australia. But the Lembeh Seadragons got their name because of their unique way of swimming, which reminds much of the Australian Seadragons. The Lembeh Seadragons live in pairs (sometimes up to 10 pairs in one area) and are usually hanging with their tails attached to overhanging walls and crevices. Before Sunset they can be seen free swimming and courting. They are extremely thin (about 1mm) and grow to about 3-4 cm in length. 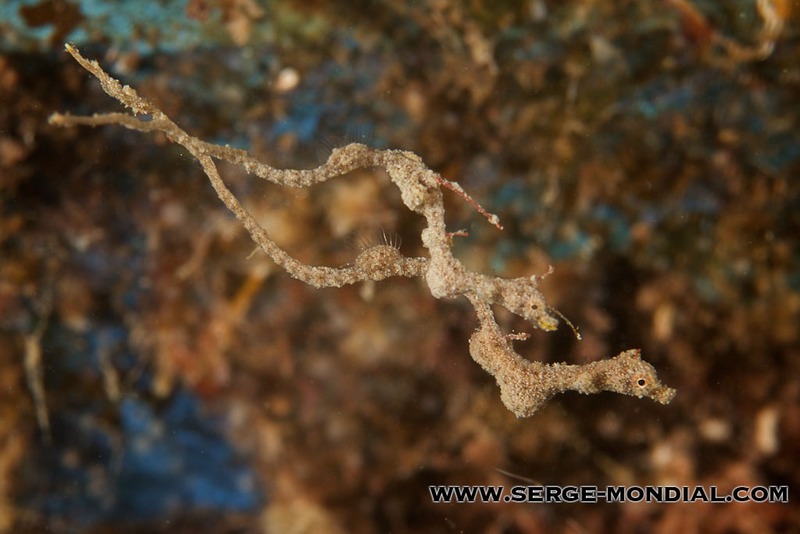 Best Places to see Lembeh Seadragons in Lembeh Strait: They can be basicly on any bigger rock or coral bommy. Nudi Falls, Pulau Abadi and similar sites are usually good to look for them. But the best place to find them is NAD Lembeh Housereef where there are constantly several pairs around since many years. Photo Tips: A 100mm Macro for photographing individuals or a 60mm Macro for photographing swimming pairs.